With his groundbreaking New York Times bestseller The Sword of Shannara and its acclaimed sequels, Terry Brooks brought a new audience to epic fantasy. Then he gave the genre a darkly compelling contemporary twist in his trilogy of the Word and the Void. Last year, in Armageddon&#8217;s Children, Brooks undertook the stunning chronicle that united two unique worlds. Now that story of clashing forces of darkness and light, of Shannara&#8217;s beginnings and the human race&#8217;s possible end, marches forward into an unforgettable second volume full of mystery, magic, and momentous events. Across the ruined landscape that is America&#8211;hopelessly poisoned, plague-ridden, burned, and besieged by demon armies bent on exterminating all mortal life&#8211;two pilgrims have been summoned to serve the embattled cause of good. Logan Tom has journeyed to desolate Seattle to protect a ragged band of street urchins and the being known as &#8220;the gypsy morph,&#8221; who is both mortal and magical, and destined to save mankind unless he is destroyed. Likewise, Angel Perez has her own quest, one that will take her from the wreckage of Los Angeles to a distant, secret place untouched by the horrors of the nationwide blight&#8211;a place where the race of Elves has dwelled since before man existed. But close behind these lone Knights of the Word swarm the ravening forces of the Void. As the menacing thunder of war drums heralds the arrival of the demons and their brutal minions in Seattle, the young survivors who call themselves the Ghosts are forced to brave the dangerous world of gangs, mutants, and worse to escape the invasion. And Logan Tom must infiltrate a refugee compound to rescue Hawk, the leader of the street urchins, who has yet to learn the truth about who and what he is. Meanwhile, Angel Perez has joined an equally urgent mission: to find the Ellcrys, a fabled talisman crucial to protecting the Elven realm against an influx of unspeakable evil from the dread dimension known as the Forbidding. But Angel and her Elf allies must beware&#8211;for a demon spy, with a monstrous creature at its command, walks among them. Hawk is missing, having vanished into a blast of white light after being thrown from a wall in ARMAGEDDON'S CHILDREN. His family, the Ghosts, hunts for him in desolate Seattle. Invading demons and horrifying creatures beyond description are hot on their trail, looking to overrun all that once was about our world. In the meantime, Hawk learns of his past, of his magic and of his destiny to lead thousands to safety, though he refuses to believe his own worth. Kirisin struggles to persuade the Elves of Cintra that they are needed for a great quest. They must seek out the Elfstones, which have long been lost to the world. Failing in this mission will result in nothing less than the extermination of Elven society. A human, Angel Perez, infiltrates their society and urges the Elves to listen to Kirisin. Ultimately, as the quest reaches its climax, disaster strikes and Angel and Kirisin are forced to flee. They have the Stones, but their use gives away their location to the demons that pursue them on their new-found and more important quest for a land of safety for the Elves. In ARMAGEDDON'S CHILDREN, Terry Brooks began the process of blending his Shannara and Word & Void series. The first book in the Genesis of Shannara trilogy hinted at those links between the two interconnected worlds. Now, in THE ELVES OF CINTRA, he boldly makes those connections clearer, even going so far as to answer some of the questions that have stuck in readers' minds for years. ARMAGEDDON'S CHILDREN was, perhaps, one of the strongest novels Brooks has ever produced. THE ELVES OF CINTRA surpasses its predecessor with ease, and it also does an excellent job of avoiding the pitfall of middle installments of a series. In general, second books are nothing more than great fillers that serve barely to go anywhere and leave little in the way of interesting developments. In addition to propelling the main story forward, THE ELVES OF CINTRA also contains its own major arc, one that is introduced and completed, giving a sense of closure while also leaving readers reaching for the next book to continue the main tale. Characters carried over also grow and become more substantial. Hawk is a prime example and Logan Tom continues to be of great interest, but the female Knight of the Word, Angel Perez, impresses me the most. She is a young and tenacious woman with incredible skills that we finally get to see her make use of. In some ways she eclipses Hawk and Logan in this story, though there is no doubt that Hawk is the main driver of the series. THE ELVES OF CINTRA remains a gloomy and gritty piece of a post-apocalyptic pie that is full of outstanding epic ingredients and characters. There are the most villainous of the vile and the most heroic, and there are those who are lost along the way. Brooks makes you care, makes you grieve and, most importantly, makes you hope --- emotions that could be lost in the hands of a lesser author. From start to finish, "The Elves of Cintra" will captivate you, take you on a whirlwind literary ride of immense proportions, and leave you hungry for the final instalment! I couldn't put this book down and had to restrain myself from devouring it in one sitting. I purposefully took my time to read it in order to extend the pleasure I was gaining from it. Mr. Terry Brooks is a true Master Storyteller! Although Hawk features very little in the novel, as the last one will be focused mostly on him , the revelations regarding him are surprising, to say the least. In fact, they are downright stupendous! The gripping storyline though is that of Angel's journey to and experience with the Elves. I like Logan Tom's storyline, too, but I couldn't wait to get back to what was happening with Angel, Kirisin, Eirisha and the Ellcrys. Be warned though: the surprises and unexpected twists, once they start coming, will pummel you with relentless force! Great follow up book. Now eagerly anticipating book no:3. I only discovered Terry Brooks as an author this year, but feel a little like when I first read The Lord of The Rings way back in the late 60's. Fortunately he seems to have written a great many more books so lot's of treats in store. I had to spend the whole day reading it! Having read all of the Shannara books, and also a few of Brooks' recent series' novels, I had enough of an understanding of the 'new or post-apocolyptic world' scenario to allow this vision to sit well with me. I would suggest a pre-requisite of having read all of the prior series' for maximum enjoyment, and at least a foundation in both 'worlds' of Brooks' to truly grasp the direction and layers, or history, that drive the plot of this novel, before reading. Assault vehicles, superheroes, elves and demons. This is a poor book, and certainly not as good as the first in this section of the saga. Multiple threats throughout, one for each of the Knigths of the Word, Logan Tom, and Angel Perez, demons, the elves, etc. Very flat writing, seems almost simplified - perhaps this is designed to make it more appealing to young children. Just an episode of the overall piece, and the two young lovers executed at the end of the last book and magically saved only appear briefly. You would want to be keen on Brooks or this storyline to pick it up. The Genesis of Shannara, first volume of a trilogy whose third volume is currently being written, leads from the Word & Void series (a modern world allegorical fantasy, also a trilogy) into the vast Shannara storyline. 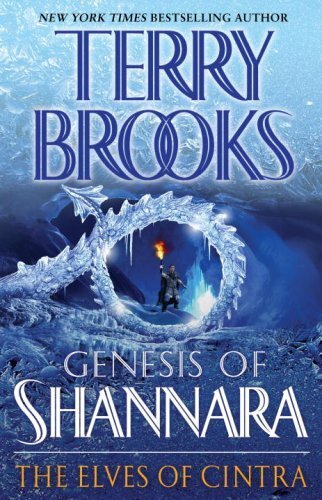 I wish to encourage readers who have not read Terry Brooks before to preface the Genesis of Shannara by reading the Word & the Void series (Running with the Demon, A Knight of the Word, and Angel Fire East), which allegorically provides us with a vision of a future brought ablout by the accumulation of relatively small evils in our world that aggregate into socio-ecological devastation for our modern world, and providing a simple clue for us how we might combat such an end in reality. In the books the demons worked in myraid small ways to affect the overall outcome: Brooks is telling us that if we all work in similarly small ways to promote our human community, and to promote healing and health, then the aggregate result may ultimately save us all. The Elves of Cintra (2007) is the second fantasy novel in the Genesis of Shannara series, following Armageddon's Children. In the previous volume, Logan Tom gave Nest Freemark's finger bones to Hawk, then left him in the compound lockup and returned to the Ghosts. Owl had decided to leave the Pioneer Square quarters and Logan Tom encouraged this move. After a few hours, Logan Tom took Panther with him and returned to the compound. While Panther kept the guards busy watching his antics, Logan Tom snuck into the stadium and reached Hawk's cell, but it was empty. Hawk had been taken from his cell well before the time of the execution, maybe to build more terror within him. He tried to talk Tessa into jumping before the guards could touch them, but she was already terrified and clung to Hawk. Then the guards grabbed the couple and threw them off the wall. Meanwhile, Angel Perez and Ailie the tatterdemalion learned that the demon Delloreen was chasing them on the Harley Crawler that they had left behind. Angel turned off onto a logging road and tried to slow the demon down and to throw it off her scent. However, the demon persevered and eventually caught up with them. Angel fought the demon, but she seemed to tire faster than it did. Finally, she knocked it aside and reached the Mecury-5 ATV. Then she charged the demon and zipped down the highway when it flinched. After King Arissen failed to recontact him, Kirisin confronted Erisha and forced her to admit that she had already passed the warning on to the king. Although she defended her father's actions, Erisha was convinced to help Kirisin look for more information about the Loden in the histories. As they were searching through the volumes, someone challenged them from the darkness. In this novel, Logan Tom is climbing the steps of the stadium to the west wall when he hears cries of shock and excitement. Near the top, he overhears comments indicating that Hawk and Tessa had disappeared without a trace. He asks a young girl about the couple and she describes the throwing of Hawk and Tessa off the wall and then the flare of a bright light surrounding them. When the light faded away, the couple were gone. On his way out of the Compound, Logan Tom sees a fleet of boats carrying the once-human toward Seattle. Although he looks and calls for Panther, the boy is nowhere to be found. Deciding to rejoin the Ghosts in their flight, he heads toward the freeway. Panther has fled the compound to avoid a group of hunting Croaks. He meets Sparrow in Pioneer Square and both of them flee from the pursuing Croaks. Everywhere they go, the Croaks are there waiting. Finally, Logan Tom appears and they drive off the Croaks. Heading down a freeway entrance ramp, the Ghosts draw near to Logan Tom's vehicle, but are faced by a group of mutant street kids. Owl is beginning to get through to the strangers when a sudden movement causes the leader to shoot her with a shockgun. The electrified leads hit Squirrel instead of Owl, but Owl also receives a lesser shock since the boy is on her lap. Bear rushes at the youngster with the shockgun and knocks him senseless. Chalk receives a minor shock from the wheelchair handles, but recovers quickly. Owl recovers more slowly, but is soon able to tell them that Squirrel needs more aid than she does. River checks out Squirrel and finds that he is not breathing. She starts CPR, but Squirrel still isn't breathing after many minutes. Owl stops her, but Logan Tom arrives shortly after that and tries more CPR. Finally, they have to give up. They load up the Lightning S-150 and head south out of the city on the freeway. In this story, Angel flees on the Mercury-5 ATV with Ailie. Behind them, the demon howls and follows. In her new shape, Delloreen is cat-like, but with scaly skin and a body over ten feet long. The demon concentrates on following the scent of the Knight as she runs through the night. In Cintra, Kirisin and Erisha have been discovered by Cluth, the keeper of the histories. He soon falls in with their plans and provides more information about the elfstones and the Loden. He tells them that a queen and sorceress of long ago had been buried in Ashenell -- the elven burial ground -- with a trio of blue search stones. Elsewhere, Hawk finds himself in a great garden, with profuse greenery stretching out of sight in all directions. An old man -- the King of the Silver River -- tells him that his memories have been edited and fills in some of the missing memories. Hawk is told that he will be the one to lead thousands of humans and elves to safety. Hawk has trouble believing the old man. This story has Angel and Ailie finally reaching the elven domain and waiting for Simralin, the older sister of Kirisin. After their mission is explained, Simralin blindfolds the Knight and guides them to the meeting hall. She also sends messengers to the king and the elven High Council. Angel is given an opportunity to tell the Elves of their danger and the need for escape to another sanctuary. Kirisin is still thwarted by the Elven King and forced to search for the Loden Stone with few companions while being pursued by demons. The Ghosts continue on toward a rendezvous with Hawk, Tessa and Cheney. Helen Rice and the rescued compound children reach the Columbia River and camp on the south bank. This volume ends with the discovery of the Loden Stone and its aftermath. Presumably this subseries will conclude with the next volume. Enjoy! Highly recommended for Brooks fans and for anyone else who enjoys tales of demonic conflict, magical quests, and familial love. Wow! This is a damned good book!!! This is an interesting tale that Brooks is weaving. Tying in the Shannara series of books with the Knight of the Word series. He is immersing the reader in the not too distant future, where man has succumbed to evil, and the last bastions of humanity are fighting for survival with the help of the Gypsy Morph and his band of children. You have Two Knights of the Word fighting to save humanity and the Elves from the Demons of the Void. You have the King of the Silver River responsible for the birth of the Gypsy Morph and sending it to help save those few remnants of humainty deemed worthy. It does pose an interesting conundrum, that those who banded together to stay alive in the Enclaves are not deemed worthy. Only those who do not want to follow rules and live free will survive. If you have read all the other Shannara series, the Federation is nothing more than these humans revisited. Is there a political viewpoint being expressed here? It is always a pleasure to read Terry Brooks. His prose is clear and easy, and unlike so many other SF authors, his books revisit his fantasy world again and again, telling fresh stories without repetition, and creating fresh, well-defined characters. But Brooks' PC preaching, especially in the first book of the series, is a distraction and prevented me from becoming immersed in the story. In the story line, the world is nearly destroyed in the near future. One would think that the few survivors, and especially the children in this story, would have little, if any, reliable information as to what actually happened to cause the destruction. Brooks could have used this uncertainty as part of his plot: conflicting rumors leading to ill-advised decisions, perhaps. Instead, we get a direct lecture from the omniscient author about what nearly destroyed the world, and there appears to be no disagreement among the characters in the story as to what happened, either: The world was nearly destroyed, not by terrorists, but supposedly by America's foolish response to the terrorists. The armies of evil are the former US military personnel, whom we are told were the most susceptible to evil. And of course, they are led by a demon. And in case this is too nuanced, the dog is named "Cheney", after a politician who always spoiled for a fight. If you happen to disagree with Brooks' world view, this is uncomfortable and not pleasurable to read. Now, here's what's so odd: the story itself conflicts with this world view. The instincts of Cheney the dog are unfailingly correct. Cheney is indeed good in a fight, and the story's hero gets into serious trouble only when he decides not to rely on Cheney. The heroes in the story are all self-reliant individuals, avoiding wherever possible the remaining collectivist governments. And the heroes fight back against the bad guys, which is okay, unlike the earlier fight against terrorists, which somehow was not okay.